Dustin asks, Is there any way that you can download streaming video off the Internet? Many sites don't want you to download the videos they stream and in some cases it might be a violation of their terms of service to do so. Having said that, there are several ways to download streaming video. Each method depends on knowing what the URL of the video is and what format is being streamed. Windows Media Format is quite popular for streaming video files. 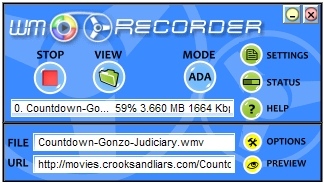 In most cases, the files end in either WMV, ASF, WSX, or ASX. There are a handful of ways to capture these files, although none of them is foolproof. ASF Recorder sometimes works for capturing Windows Media Files, although it doesn't work in all cases. WM Recorder is the most consistent solution I've found for saving video streams from online sites. There's two ways to get a version of the application. The most recent version, WM Recorder 12, is available for about $50 and well worth the ability to download video. I have an older free version of WM Recorder, which works exceptionally well, but doesn't seem to be available online anymore. Essentially you just tell it the URL where the video file is and the application will copy the video stream to your hard drive. The big advantage of the pay version of WM Recorder is support for most file formats, including WMA, WMV, ASF, ASX, MPEG, AVI, WAV, RM, RA, FLV, MP3, and MOV. It won't work in every case, but I rarely find something it can't grab. VLC Player is another app for copying streaming video. It supports a wide variety of options for downloading streams, but has a lousy interface for this feature and is very inconsistent in its ability to download video streams.